First Team Force III outside basketball goals come a 54" wide clear acrylic backboard designed for playgrounds and parks. Each system carries a lifetime warranty. The Force Adjustable Basketball Goal offers infinite adjustability, exceptional rigidity and maximum durability for those serious about basketball! The Force Goal's tough 5" square, 3 / 16" thick vertical post and dual-strut extension arm make this system a real powerhouse. The bolt down anchor system allows you to take the goal with you when you move. Our EZ-Crank adjustment means players of any age, size or ability can change the rim height. To adjust, simply turn the crank handle. The Force Adjustable Basketball Hoop is infinitely adjustable from 10' down to 5'6". The rim height indicator shows the height of the rim. The unit features our "Spring-Assist" which reduces the effort required to crank the goal. This is particularly beneficial for families with young children adjusting the unit. 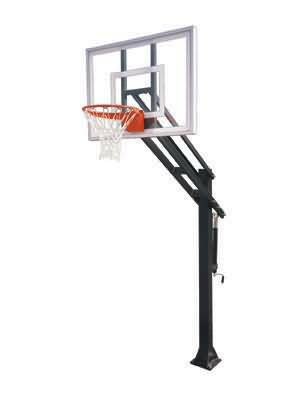 First Team offers a large selection of backboards and rims with the Force Basketball Hoops. Choose a Force Adjustable Basketball Goal package with one of our Response tempered glass backboards if you are wanting authentic gymnasium style ball reaction off the board. For additional safety, pole padding and backboard padding are available for most Force Basketball Hoop packages. Every Force Adjustable Basketball Goal package comes with a Lifetime Superior Warranty.